We examine the extraordinary statistics behind Manchester City's 6-0 thrashing of Chelsea. 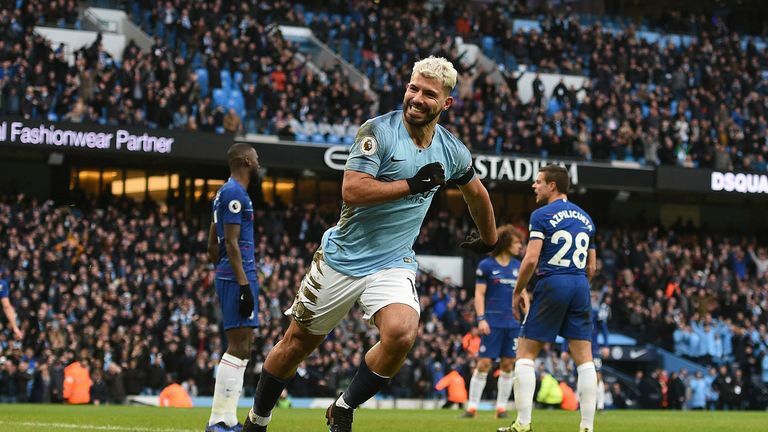 Pep Guardiola's side blew Chelsea away in an extraordinary game at the Etihad Stadium, with Sergio Aguero scoring a hat-trick, Raheem Sterling netting twice and Ilkay Gundogan also finding the net. The victory took City back to the top of the Premier League table in emphatic style, piling the pressure on Maurizio Sarri, but how did they do it? Explore the numbers with our interactive tools. 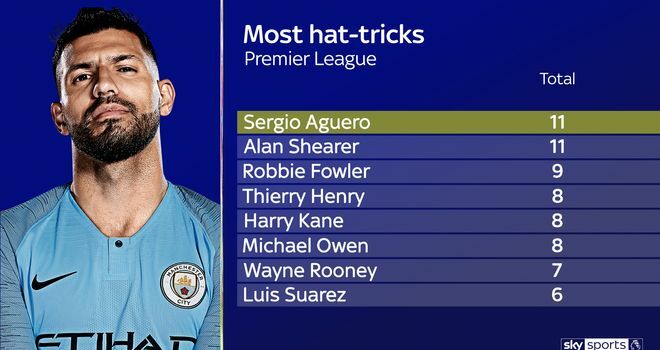 Aguero made it two hat-tricks in a week and 11 overall - equalling Alan Shearer's Premier League record in the process. The Argentine's first was the pick of his goals, a stunning long-range effort into the top corner after Sterling had scored the opener, and he doubled his tally with a smart first-time finish following a Ross Barkley error just six minutes later. Aguero completed his hat-trick from the penalty spot early in the second half and made way for Gabriel Jesus soon afterwards, but while he left the pitch with the man-of-the-match award already secured, he could easily have had more goals. He somehow missed an open goal from a few yards out before his first, and also struck the crossbar with a header in the second half. The treble put him joint-top of the Premier League scoring charts alongside Liverpool's Mohamed Salah on 17 goals. His goals also took him to 160 in the Premier League overall, making him City's top scorer in league games ahead of Eric Brook and Tommy Johnson (both 158). Guardiola had clearly identified a weakness on Chelsea's right, with City repeatedly targeting right-back Cesar Azpilicueta and right-sided centre-back Antonio Rudiger. According to Opta, they directed 51.6 per cent of their attacks down that flank compared to 25.8 per cent down their right and 22.6 per cent through the centre. It worked perfectly. Sterling scored the opening goal from that position, and it was the same story for Aguero's first goal soon after that. Gundogan then struck City's fourth from a similar area. Even the penalty was a result of Sterling winning a penalty from Azpilicueta on the right-hand side of the Chelsea box, with City left-back Oleksandr Zinchenko then setting up City's sixth goal from the same position. City's average positions showed just how high up the pitch Sterling played, allowing him to get in behind Azpilicueta while Aguero exploited the space between around Rudiger. City were ruthless but Chelsea did not help themselves. The first goal set the tone for a shambolic defensive performance, as Bernardo Silva was left in acres of space to receive Kevin De Bruyne's quickly-taken free kick before crossing for Sterling to finish. In the Sky Sports studio, Jamie Carragher described it as "criminal" negligence from Chelsea left-back Marcos Alonso. There was another costly error for City's third goal, as Barkley inexplicably headed David Luiz's clearance back into Chelsea's box, where Aguero was waiting to take advantage. Kepa Arrizabalaga then should have done better with Gundogan's strike, while Azpilicueta was clumsy for the penalty. The visitors were also overrun in midfield, with Sarri inviting yet more questions over his reluctance to use N'Golo Kante in front of his defence. Jorginho offered precious little protection, making just two tackles and four ball recoveries compared to four and six respectively from his opposite number Fernandinho. The Italy international struggled in possession as well as out of it, with City putting him under pressure at every opportunity as he posted his lowest passing accuracy rate of the season (83 per cent). 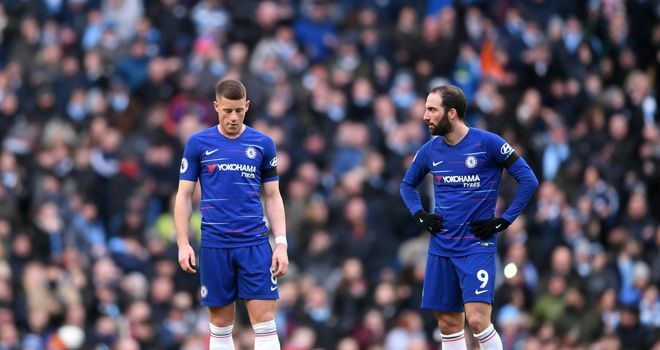 Gonzalo Higuain and Eden Hazard did threaten at times, but they could do nothing to prevent Chelsea's humiliation. The 6-0 scoreline made it their heaviest defeat in any competition since 1991.